I do love a challenge and when I saw the recipe for my very first Daring Cooks challenge I could not help but smile. The 2010 March Daring Cooks challenge was hosted by Eleanor of MelbournefoodGeek and Jess of Jessthebaker. They chose to challenge Daring Cooks to make risotto. The various components of their challenge recipe are based on input from the Australian Masterchef cookbook and the cookbook Moorish by Greg Malouf. I am already a huge fan of risotto as my previous blog posts will attest to, but I had never made my own stock from scratch before. It is not a difficult task but something new and certainly worth the effort. The trick to a risotto I have found it to keep stirring. It sounds silly and simple but It certainly makes a difference. It is not a difficult step in the process but to keep up your motivation to constantly stir a dish for 20-25 minutes requires some concentration and dedication. Other than that your imagine is really the limit when it comes to flavouring your risotto. 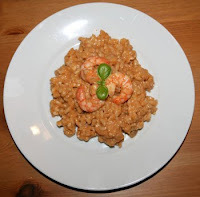 Last night’s was a tomato and prawn risotto which was a first time combination for me as I normally stick with butternut or mushroom, but it was fantastic and made for a pretty good picture for my blog post. I have to say thank you for Jel’s help with this one, his strong arm kept up the stirring and made the risotto delectably creamy. Roll on next month’s challenge! Congratulations on your first challenge and hello and welcome to the Daring Cooks' I hope you have many other happy experiences with us! 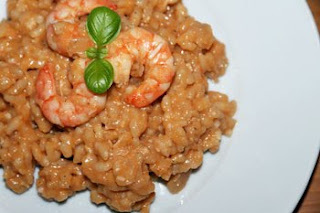 WOW I just love the last photo of your risotto the colour is fantastic and so shiny. I just adore prawns and with tomato it is even better. Superb work on this challenge. If you add them to your post this will really help; each challenge has it blog-checking lines you can find them near the start of the reveal challenge.